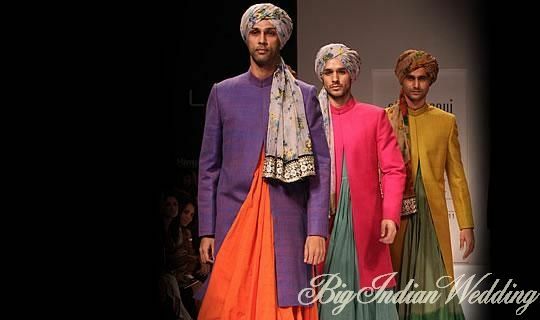 Where we discuss a lot about women dresses, trends, shoes, accessories blah how come we forget to mention men things? No, seriously this fashion point is not unique to women but provides information about the range of men’s products and dresses. South Asian men are familiar with kurta shalwar, kurta pajama, sherwani suit for a long time and are so importantly worn on the events like weddings, Holi, Raksha Bandhan, etc. 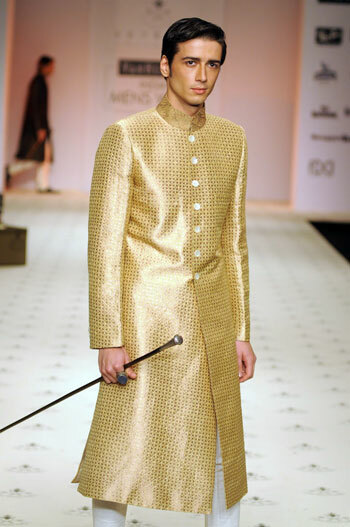 Where ‘Sherwani’ is the most famous dress for men. Like we say that lehenga occupies the label of being a bridal dress but is worn by other women on various events too similar is the case with Sherwani, where Sherwani is a special dress for groom does not mean that boys can not wear it at other events. 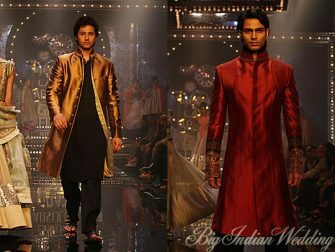 Sherwani gives a fantastic look to men at events.Today we will cover top men Indian designer sherwanis trends and recent collections. 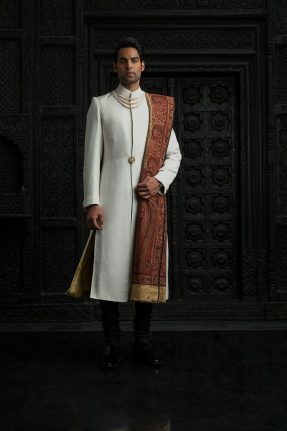 Let’s first talk about grooms. 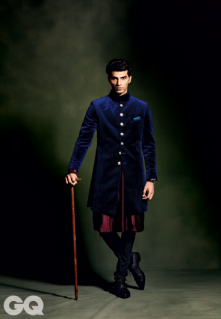 Sherwani suit is the must groom attire which gives an amazing classy look to him. 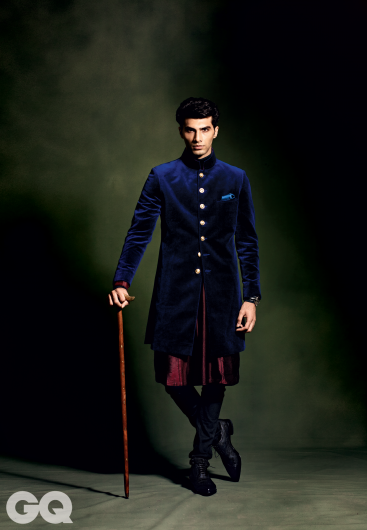 As every man desires to look different and classy in his attire that what can beat designer Sherwani? Of course no one. 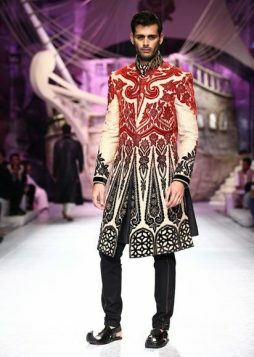 The designs of Sherwani has undergone exceptional changes that is the reason it is one of the most demandable pieces of art. Designers have no doubt made a worthy effort in the progress of sherwani designs. Usually, sherwani is made in a way that it matches with the bridal dress too like color combinations are made similar to the dress of the bride. And this thing attracts everyone a lot I guess. 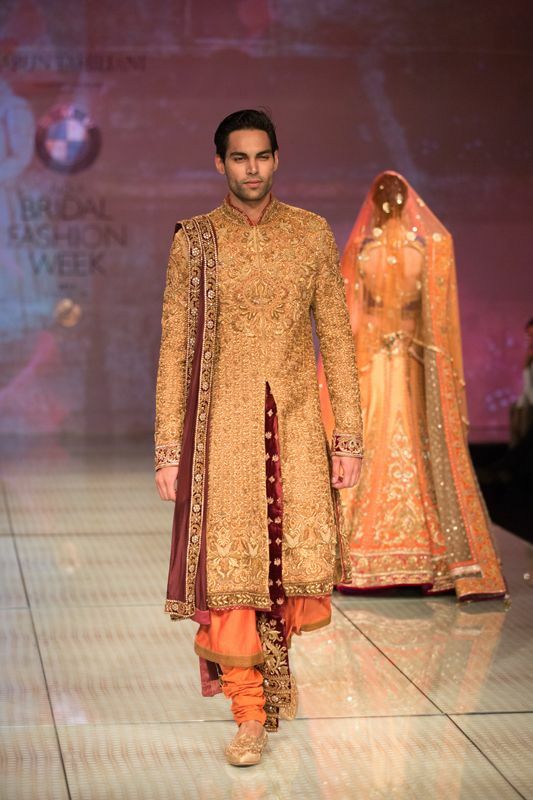 A beautiful bride coming with her groom with matching outfits leaves an impression of ‘wao’ on the onlookers. 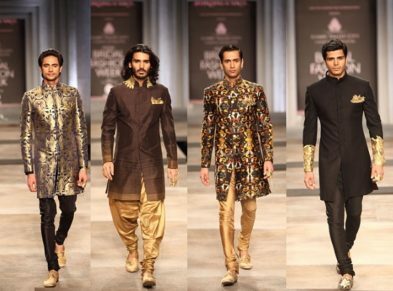 At this age where artists have reached the heights of the sky in the fashion field, they surely have left everything behind regarding Sherwani designing. 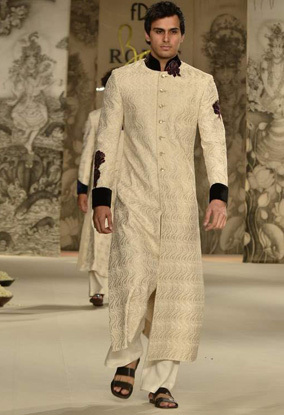 This outerwear on kurta shalwar consists of a ban gala and a button line starting from the top middle to bottom. 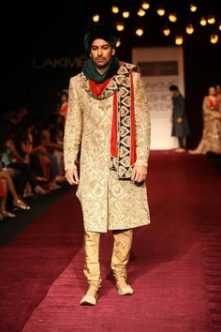 Embroidery work of tile, zari, cutwork, etc. 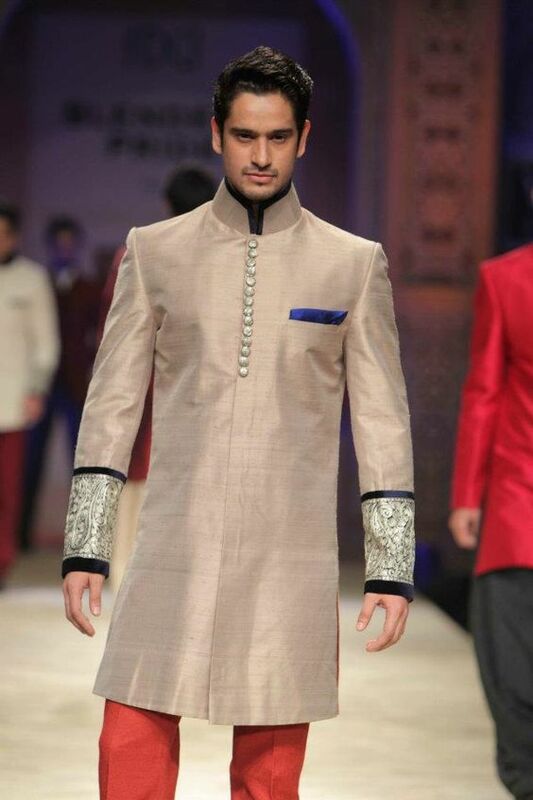 is made on the neckline around the shoulders. 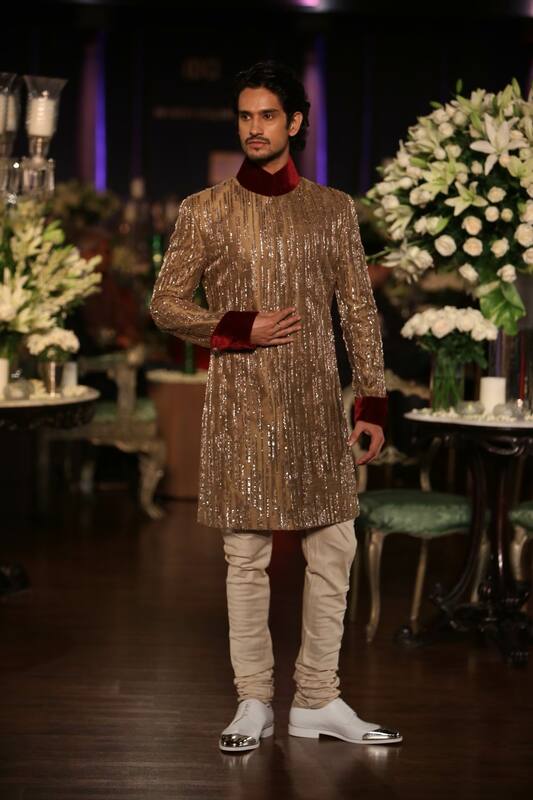 Not only this but approximately whole sherwani is covered with the spray of embroidery where sometimes a patch of embroidery or motif is pasted on the upper back. 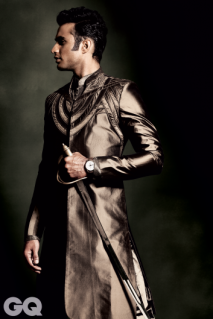 The dress is worn along with matching patka or turban which increases the grace of Sherwani even more. These turbans are made of various materials, chunri or sheer cotton drape, with or without zari work in different colors. 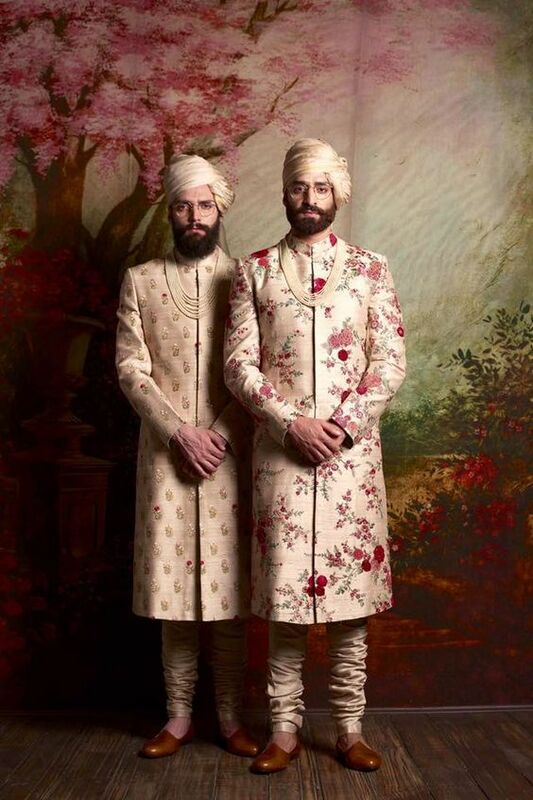 Traditionally groom’s turban is in the red color. Hence, Sherwani depicts an Eastern dulha no matter at which part of the world wedding is being performed almost all Eastern people use this dress at their weddings. 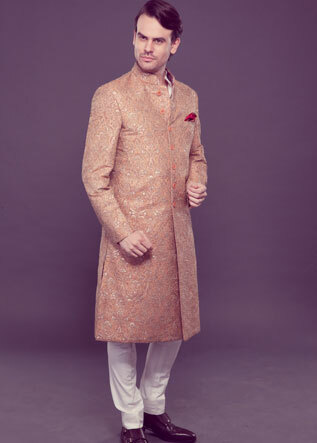 Now come to the Sherwani other than groom dress, we see boys, men and even little kids wearing sherwani looking extraordinary cute for weddings and cultural events. 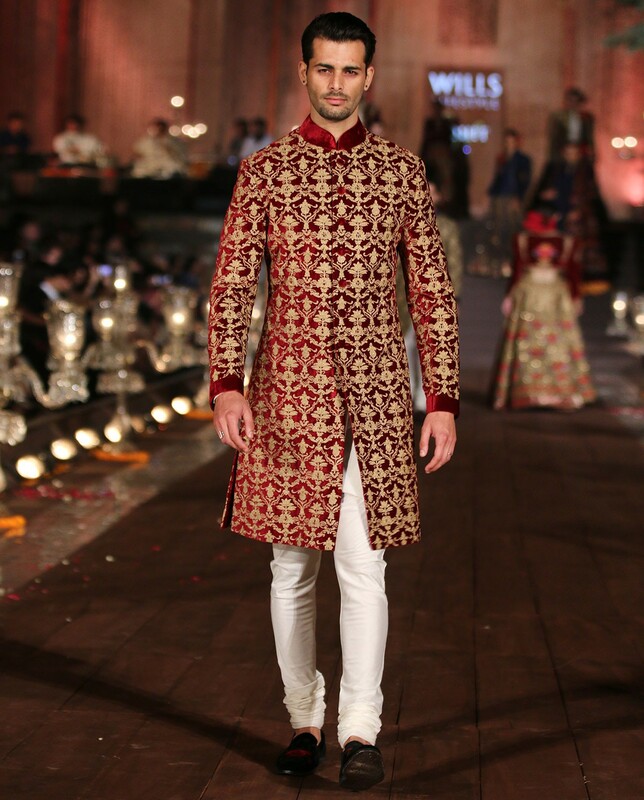 Here we are sharing some of the best and renowed Indian designer sherwanis collection. Have a look. 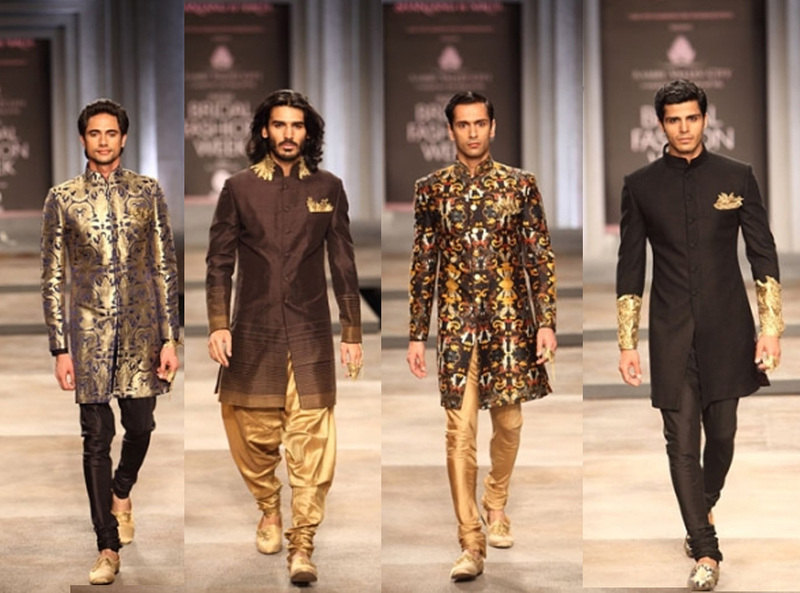 Here, we show you the latest Sherwani design collection for men by Indian designers. 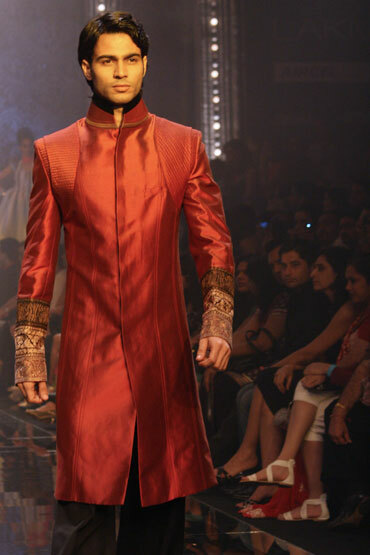 Manish Malhotra is one of India’s best fashion artist and creators. 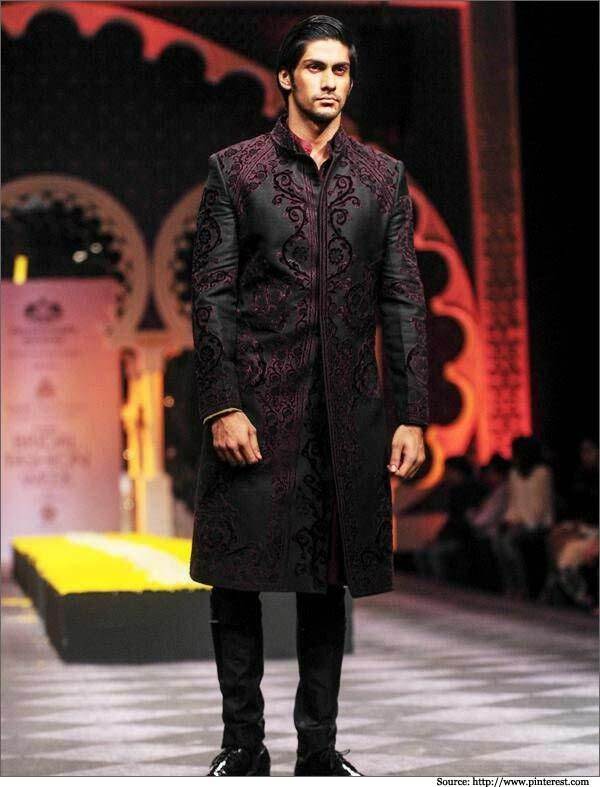 He has intended for some heading performing artists in Bollywood. Manish Malhotra is known in the Indian film industry for his Variety of style and his capacity to imagine a unique look for the character. 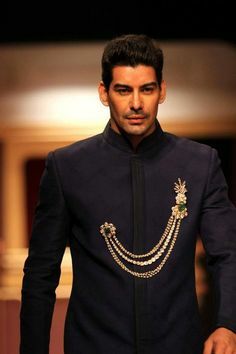 Manish won numerous honors at most abnormal amount including Stylish Designer Of the Year at the Elle Style Awards in 1999 and Filmfare Awards South for Costume Design in 2010. 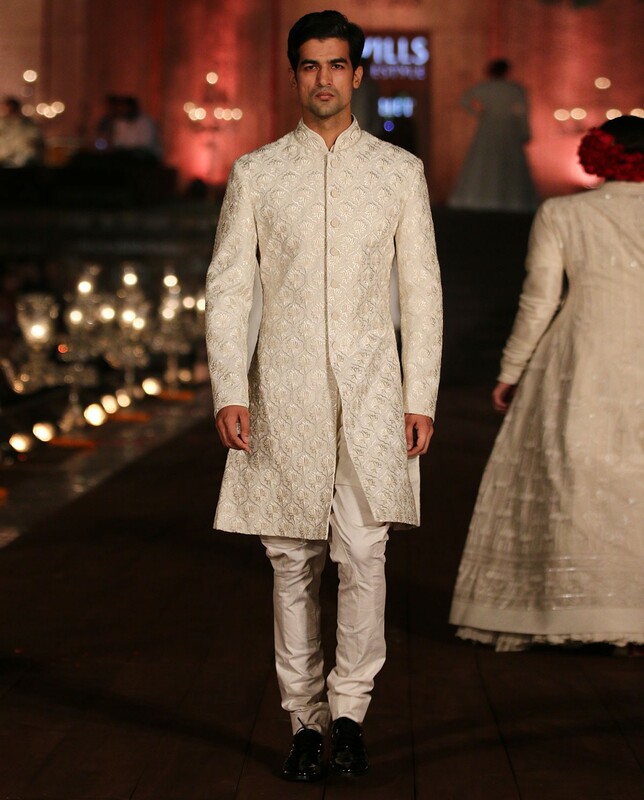 Manish has presented his new outlines of sherwani that goes popular all over the world. 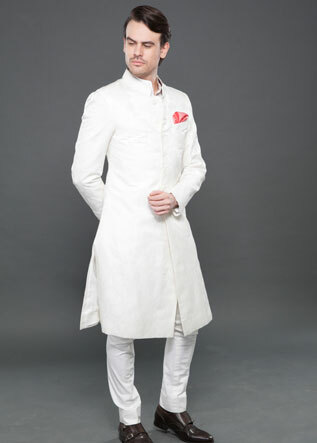 If you are searching for an Indian style of sherwani his stock, may help you in your choice. 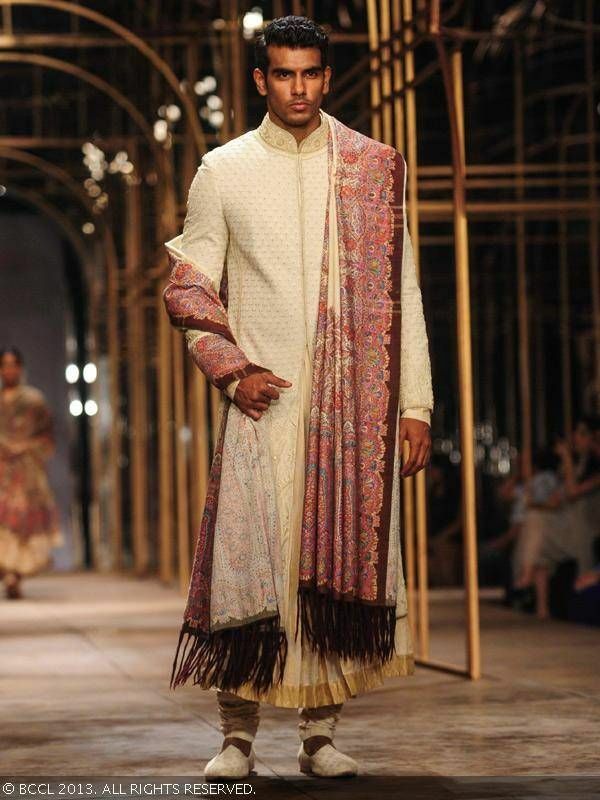 Some designs we have posted below which include the best Indian designer sherwanis by Manish Malhotra. 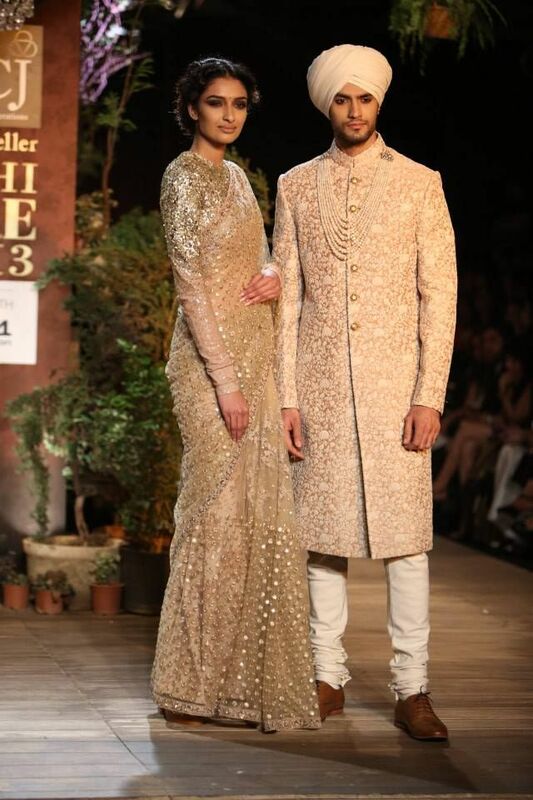 Rohit Bal having strong Kashmiri background is a style built fashioned artist at present working in New Delhi, India. 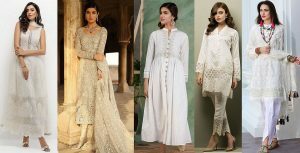 Bal began his vocation with his sibling Rajiv Bal in New Delhi in 1986 the Company Orchid Oversea Pvt.ltd and began his first free accumulation in 1990. Rohit Bal always has been in designing the cast dresses for men in Bollywood. 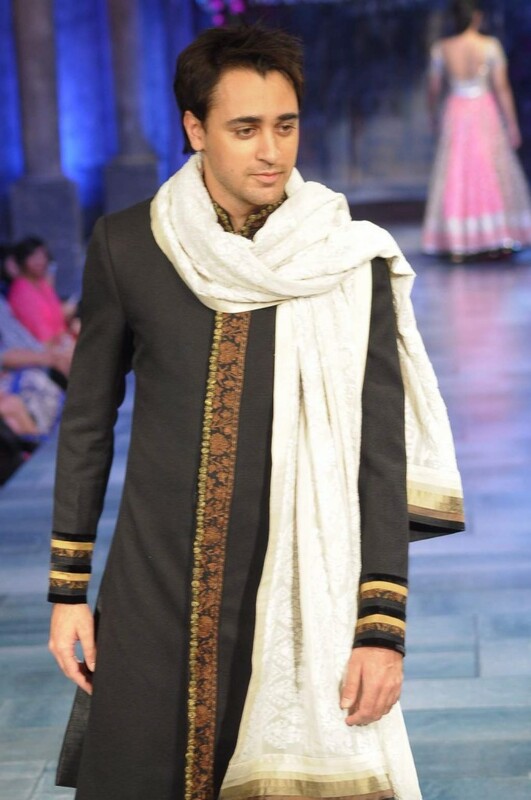 Bal has his stores in all significant urban areas of India. 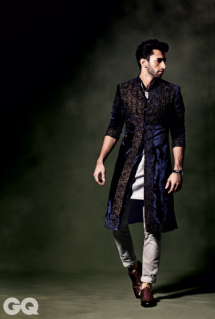 Bal’s sherwani outlines have both a conventional and current western look. Such lovely blends without a doubt suits to youthful and also more seasoned costumers. 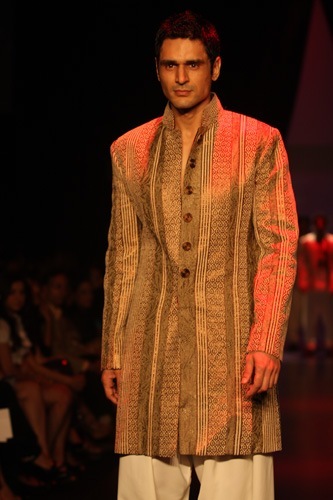 Raghavendra Rathore is settled Indian design originator, conceived in Jodhpur India. 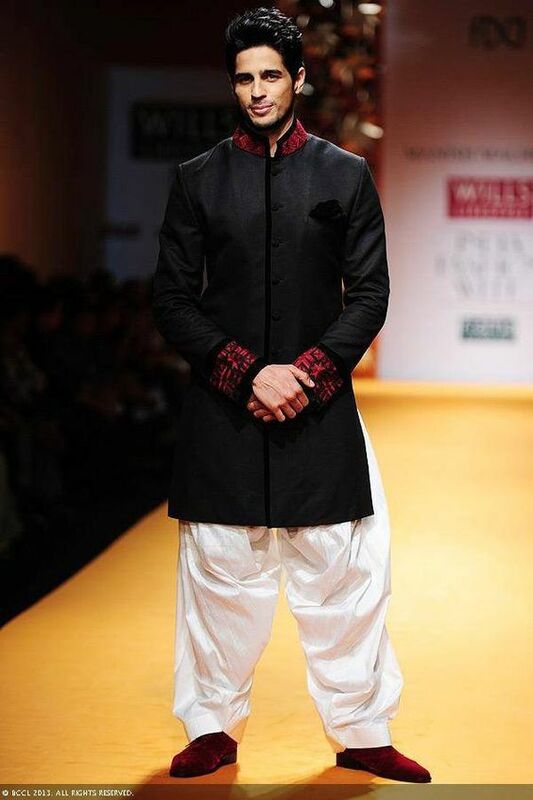 He has got the distinction because of his work for advancing the social legacy of India through his work. 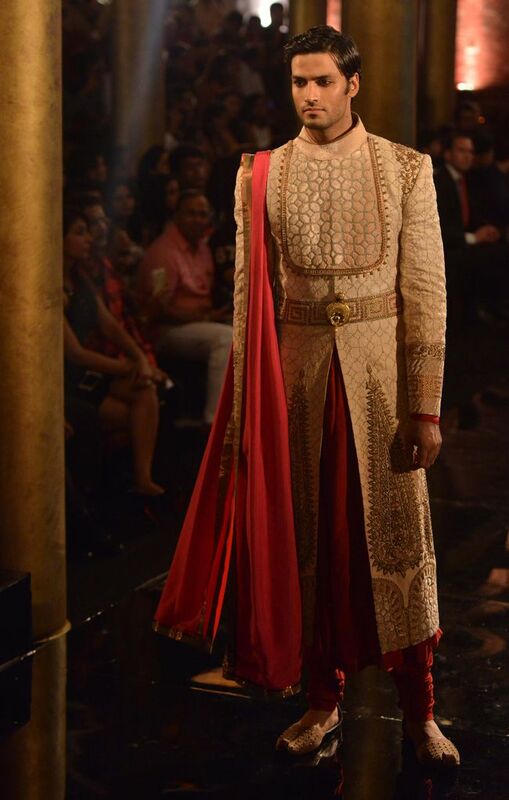 Rathore has designed so many bridal and wedding collections. 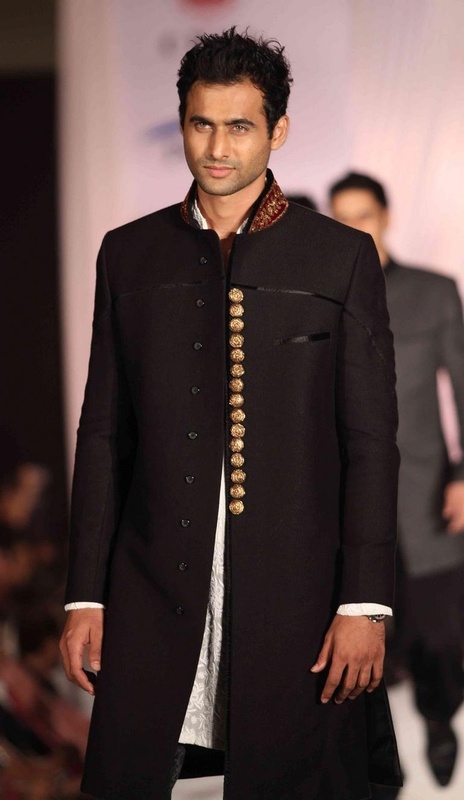 He is best in designing wedding sherwanis and party wear dresses for men. He has won a recompense recognizing his work for advancing society from CM of Rajasthan. His sherwani outlines additionally portray old Indian style which has its polish and class. 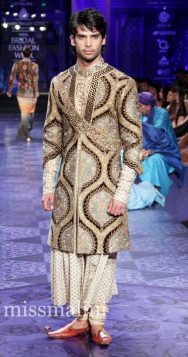 It will provide for you an old fantastic feel of conventional sherwani, and in the meantime, these sherwani’s are agreeable and a la mode. 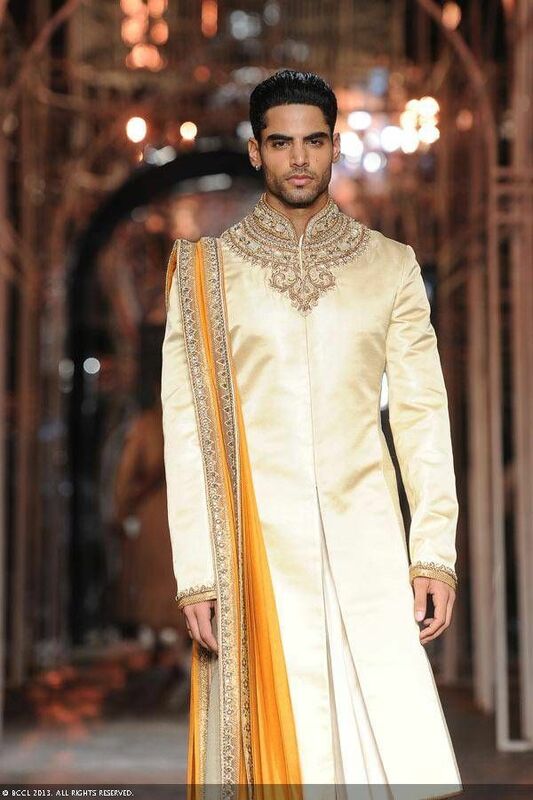 View some of the Indian designer sherwanis by Raghavendra Rathore. 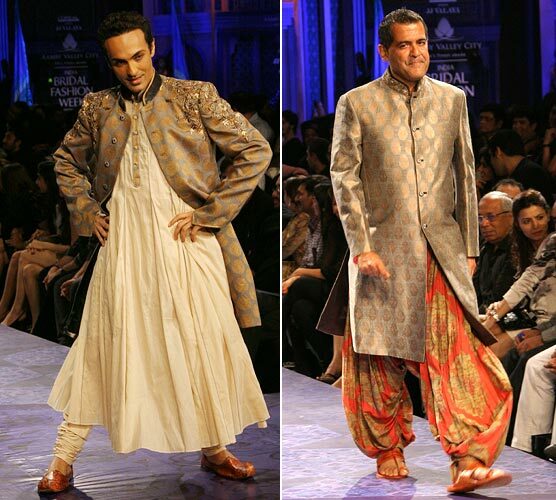 Rajesh Pratap Singh is one of the Top Indian Fashion Designer from New Delhi India. 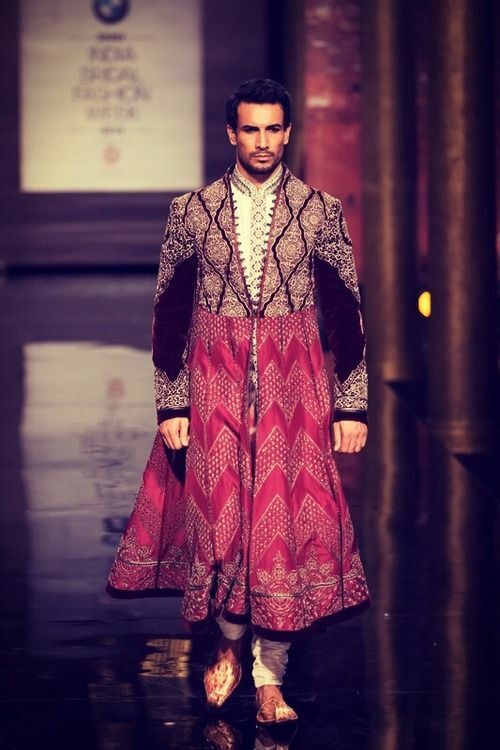 He is initially from Rajasthan, moved on from NIFT, Delhi in 1994, then again he was prepared with New Delhi-based originator David Abraham for a prior year graduating. 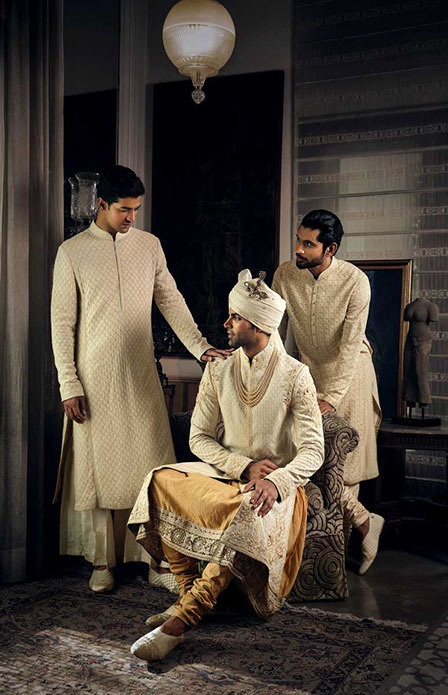 Pratap is the best foe designing Men Wedding Wear Dresses for Grooms and Dulhas, which includes a wide variety of sherwanis, gowns, Kurtas pajama, Shalwar Kameez and other couture dresses for Gents. He further went to work with the Italian menswear name, Marzotto for a long time. 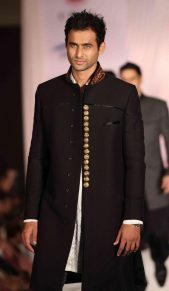 Rajesh Pratap Singh began his particular line of men’s and ladies’ dress in 1997 after his knowledge of two years in the manner business in India and Italy. 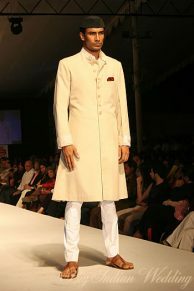 Singh has won top recompenses in Indian manner industry that incorporates Best Menswear Designer honor at the Fashion Awards 1996; he likewise won Designer of the Year at the GQ Men of the Year grants in 2009. 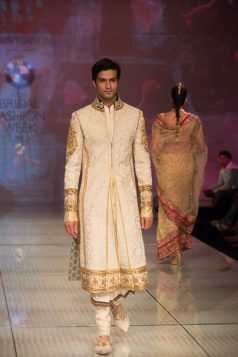 Some of the finest quality sherwani plan particularly for grooms are outlined by this man, which are said to be as best accessible in the business. 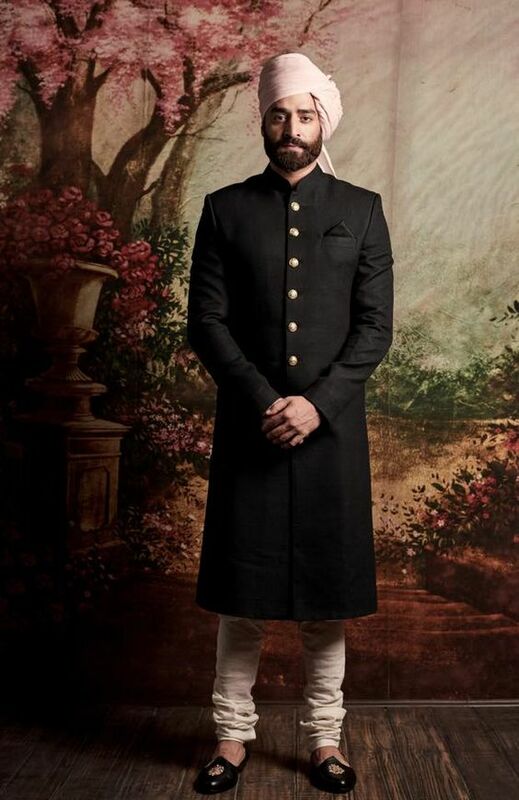 One of India’s most youthful board part of the National Museum of Indian Cinema, Sabyasachi Mukherjee was conceived in Kolkata in 1974. 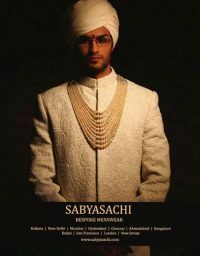 This 40-year-old fellow began his extravagance garments mark in 1999, now utilizing name Sabyasachi. 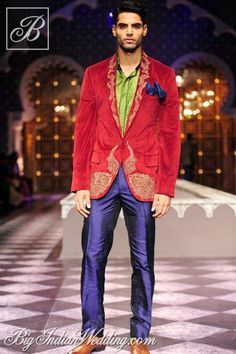 He has likewise worked for Bollywood motion pictures, for example, Guzaarish, Babul, Laaga Chunari Mein Daag, Raavan, English Vinglish and so forth. He dispatched his select menswear accumulation offering Sherwani’s, Kurtas and headgear at the Lakme Fashion Week Spring Summer 09 Grand Finale show. Since then, his sherwani accumulation is held up and wear by a lot of people around the nation and outside nation also. 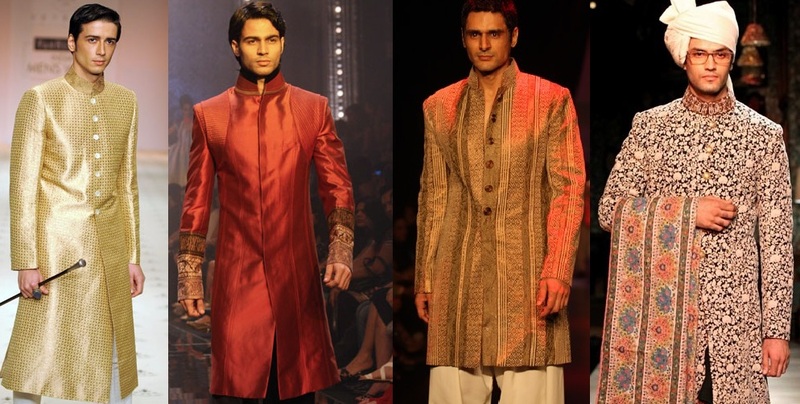 All outlines give excellent Indian look with the combination of western beautiful layer look. 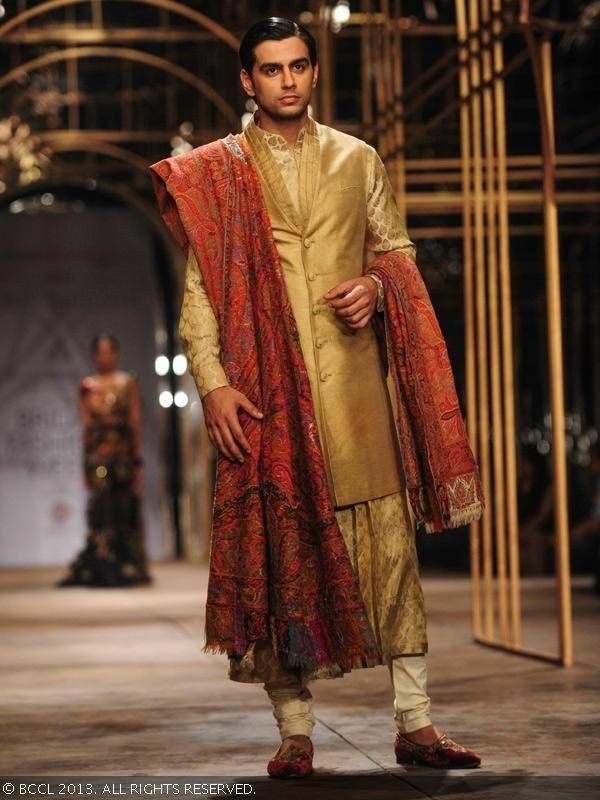 Tarun Tahiliani is a prominent Indian design creator With his wife Shailja “Sal” Tahiliani; he helped to establish Ensemble, India’s first multi-architect boutique in 1987, took after by Tahiliani Design Studio in 1990. Situated in Delhi, he is best known for his capacity to imbue Indian craftsmanship and material legacy with European custom-made profile. His mark is to join customary feel with a cutting-edge plan. 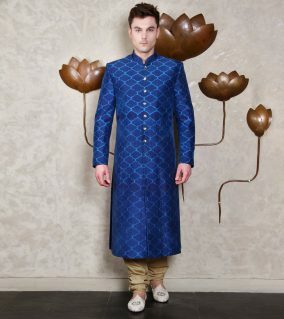 As he has got his instruction from America, Tarun’s plans are an excellent case of Indian customary style sherwani and imaginative western style apparel. 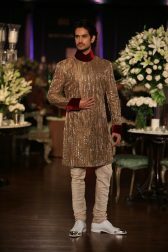 Particularly the individuals who are adolescent and need to wear a special sherwani they will certainly like this fashioner. View some of the Indian designer sherwanis by Tarun Tahiliani. Valaya, the originator and manager of the design house, House of Valaya, was conceived in 1967. 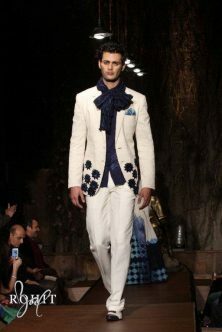 He began this extravagance house in Delhi in 1992 alongside his sibling. 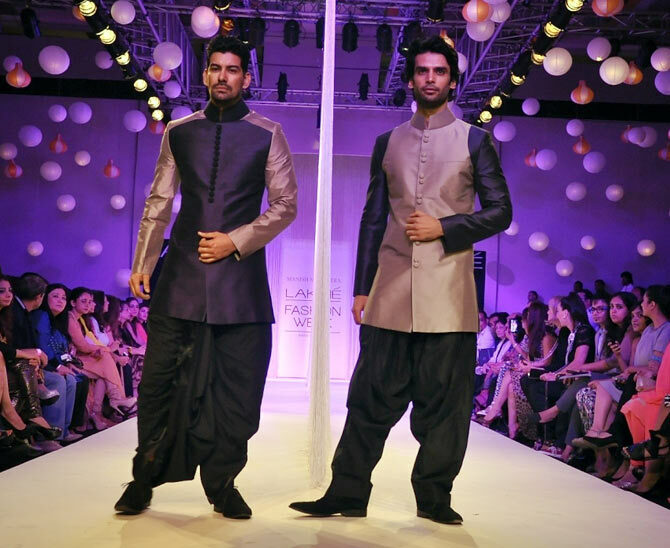 JJ Valaya has introduced many sets of clothing in Men & Women’s clothing. 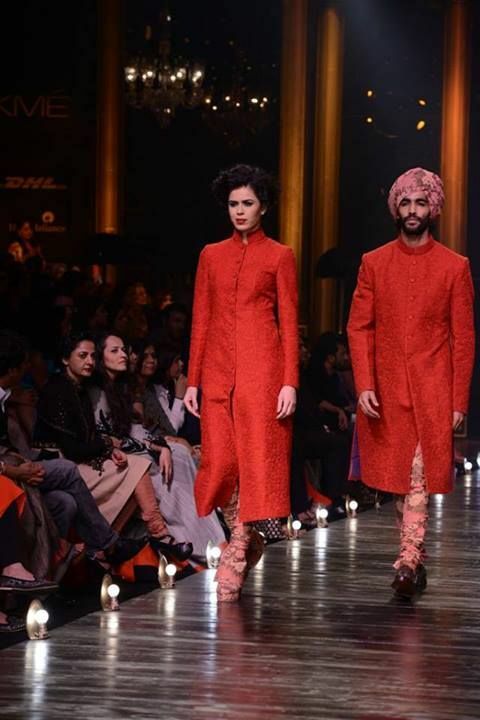 An establishing part of Fashion Design Council of India FDCI and the first worldwide brand diplomat of Crystal Titan Swarovski, he has been outlining for men and ladies for recent years. 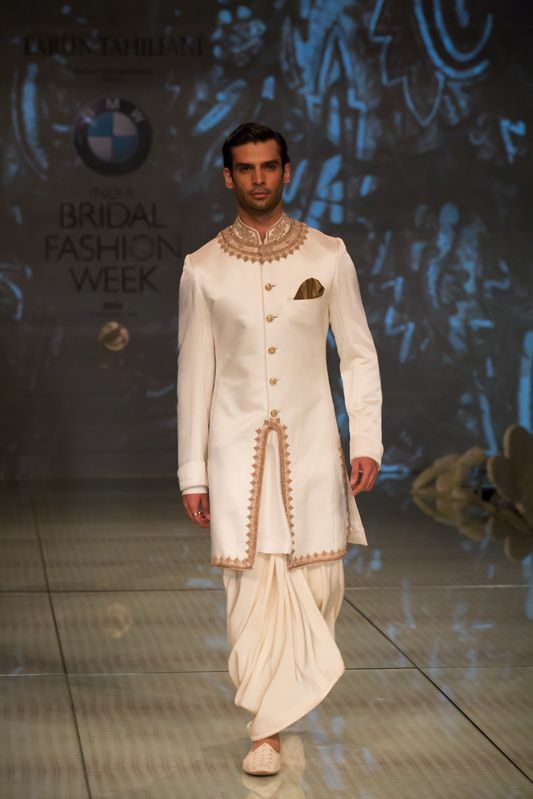 Valaya presents sherwani outlines that are mainly made for day capacities. 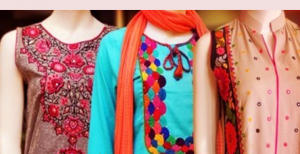 It gives costumers bunches of the decision given distinctive color Variety. 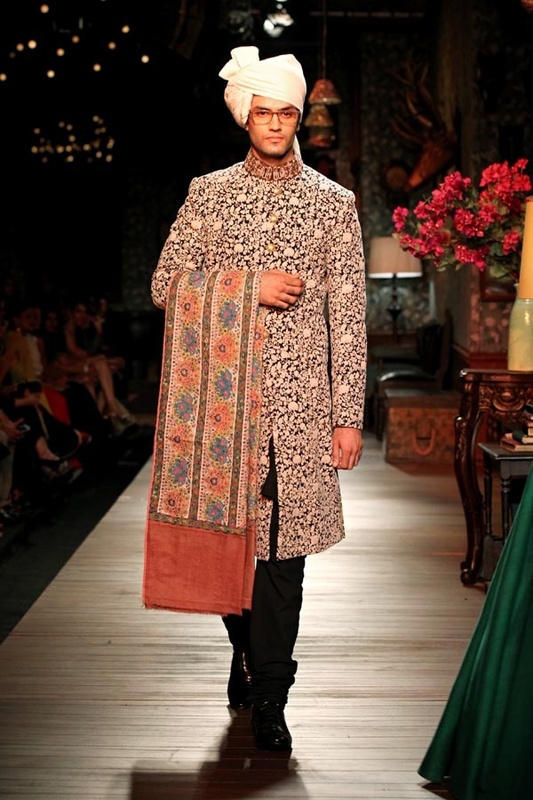 View some of the Indian designer sherwanis by JJ Valaya.